Remember that in the Gothic period England observed the dictums of Rome, and so there was considerable communication between the continent and the island. Here in England we shall study two cathedrals, which very much followed French advances, and in one instance, Westminster, took masonry construction to a level never seen before on earth. We shall be looking at the longest church in England and then at the tallest. There could be other English offerings in our program, but in actuality there has been considerable altering of so many English churches that we would not be getting an accurate view of their initial form of construction. In any event, the longest and tallest seems like a good range of contrasts, and everything else would be in-between. Distinct differences in English churches, as opposed to those on the continent, will be introduced in our first Cathedral, that of Winchester. 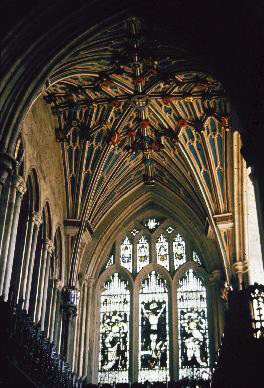 A footnote here: The Early English and Decorated Periods include Lancet, Geometric, and Curvilinear Gothic arch forms; the Perpendicular Gothic is also referred to as Rectilinear Gothic. Additional note: Henry VII revived Roman details and superimposed them on Gothic structures. Very often such changes caused works to be dubbed “Renaissance” in other countries – Henry was a bit early in England for such a designation. The city is located in the south of England, a bit southwest of London. For centuries it was the capital of England, and lays claim to having the longest cathedral in England, one of the longest in all of Europe. Situated on the banks of the river Itchen in Hampshire, the cathedral lies to the south of a high street, which was originally laid out before the Romans came to Britain. Celts occupied the area before the Romans, who came and named the place Venta Belgarum. In 519 it became the capital of Wessex and in 675 the See of a Bishop (office of the chief bishop of a particular church). Egbert of Wessex was crowned here as King of England in 827, and fortunes rose in the town, reaching their height during the reign of Alfred the Great, who was King from 871 to 901. William the Conqueror, a familiar name (see Caen above) crowned himself here in Winchester and also in London. It was not until the time of Henry III (1216-1272) that London finally displaced Winchester as capital of England. St. Birinus, first bishop of Dorchester, brought Christianity to Winchester in 635 and that Episcopal See was transferred from Dorchester to Winchester in 676. Almost without exception, churches in England have green space surrounding, or adjacent to them. This is sometimes caused by the fact that the church is on the edge of town, but not always. Another sort of rule is that English churches are long and low. That is precisely the case with Winchester Cathedral. Because of its position in a green “close,” it is easy to walk around the church. Its length measures 170 meters (556'), and when it was originally built it was even longer. A local publication states that while continental and particularly French cathedrals express their wealth by height, English cathedrals are relatively low, but rich in decoration. 1. To compete with other cathedrals which were built in the years shortly after the Norman Conquest - in particular with Westminster, which was vying with Winchester for status as England's capital in London. 2. To present formidable evidence that the new, Norman rulers of England were in control, and had God on their side. 3. To keep the local population occupied with a considerable project, and hence discourage rebellion. 4. 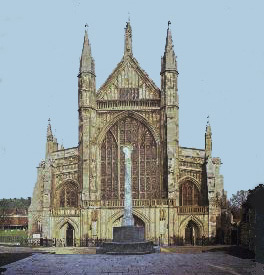 To fit the available space, providing adequate building space for the east end of the new cathedral, alongside the existing Minster (church) before it was demolished, while allowing the new west end to replace it. The main approach from the high street to the cathedral brings us to the west front. The main body of the cathedral is about 900 years old, but the work we are facing is about 600 years old - a new west front was needed when Bishop Erdinton shortened the cathedral in the 14th century. The stonework has recently been cleaned, and the light stone is particularly striking in bright afternoon sunlight, in fact, it is dazzling. There just are not enough sunny days in England to make this any kind of problem. 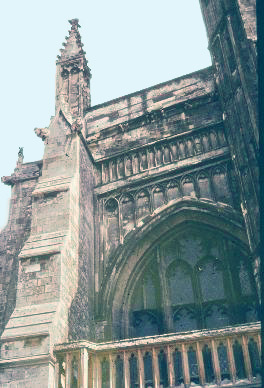 This is the left (north) side of the front elevation, showing a pointed arched window above the left portal. Walking eastwards we pass the north wall of the nave on the right, and approach the north transept ahead. 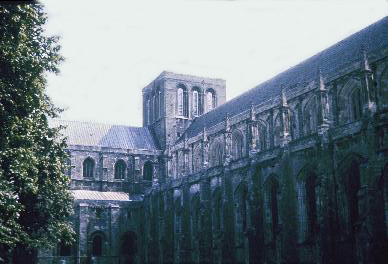 In essence both the nave and transept are part of the original Norman cathedral of 1079, but the nave has been heavily modified, while the north transept remains virtually unchanged. The round arches above the lower windows on the transept and on the tower are typical Norman arches. The highest windows on the transept are later replacements. For four years after the Norman conquest of 1066 the Saxon bishop (Stigand) remained in place. In 1070 he was replaced by a Norman bishop (Walkelin) who, with Hugh the mason, undertook to replace the Saxon cathedral. The foundations were laid in 1079, and the building dedicated in 1093, at which point the Saxon cathedral was demolished. Thus was born Winchester Cathedral. 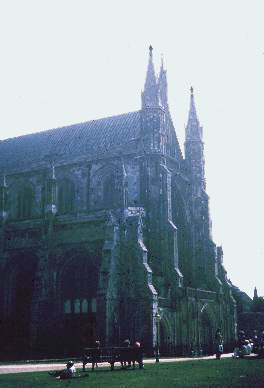 The large projecting buttresses in the nave wall were added when the nave was remodeled in the 14th century. The intent was to provide additional strength, but in practice they were not given adequate foundations, and were found in the early 20th century to be effectively hanging, unsupported, from the nave wall and hence detracting from, rather than adding to, the strength of the building. The nave and transept walls allow a setback for typical clerestory windows above. There are no flying buttresses as yet. Forces from the inner walls (clerestory area) rest on heavy masonry supports connected to the outside-buttressed walls. Pinnacles being placed on top of the buttresses provide additional stability. We first noticed this in French Gothic designs – if you will remember, the notion of someone standing on your shoulders as you lean against a wall, pushing you into the ground, preventing the wall from toppling you over. 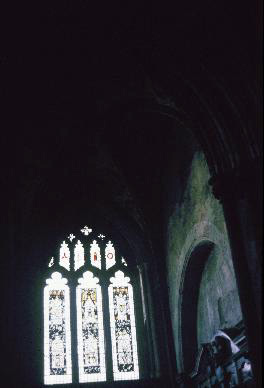 Passing the end of the north transept it is obvious that some of the Norman semi-circular windows remain, while others have been replaced or adapted to later designs. The corners of the transept have been thickened by buttresses to strengthen them. The end wall has three further buttresses to provide additional strength. This is early Norman building, gaining its strength from the weight of masonry. As masons developed greater understanding, their structures became less massive. The other characteristic of early Norman building is the simple decoration. There is a serious lack of sophistication in design here, when compared to works by William and Matilda in Caen. Realize that this construction, under supervision it seems from the Norman conquerors, is almost like a colonial situation, and in architecture, as discussed very early in this course, that means lesser quality in both design and construction. At the top of the northeast corner of the transept the structure becomes muddled. It appears that the original design intended a tower at this point, but during construction, plans were changed. There is also the start of an arch in the north wall, and the last window in the east wall is inconsistent with its neighbors. The chancel, which contains the choir and the altar, was completely rebuilt in the 14th century and remodeled internally in the sixteenth. Like the nave and north transept it used a heavy masonry structure, but increasing sophistication allowed the architect to provide more interior light, and less weight to the structure. Flying buttresses appear here, and are used to transfer pressures from higher points on the wall. Pinnacles are still used, but windows are larger, and there is more decoration. The cruciform shape produced by the projecting transepts follows that begun in France, but those transepts are much more pronounced here. The apse, which is typical of most English churches, is squared off, straight, no semi-circle. Some internal facts and figures: the width of the three-aisled church is 27 meters (88'), the height of the nave is 24 meters (77’-6”), and the height of the side aisles is 13 meters (42’-3”). There is no triforium gallery, which is partly why the side aisles are so relatively tall. 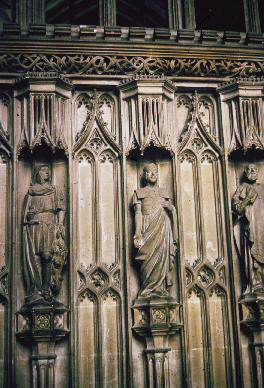 Of internal note is the grille on the choir, which separates it from the transepts; it is a masterpiece of wrought iron work. The oak choir stalls, with accompanying canopies and misereres (support for standing singers) dates from 1308, with some more recent pieces dating from 1540; these are the oldest in the country. Though perhaps only known to some “golden oldie” nostalgia buffs, who might remember the very nasal rendition of the song Winchester Cathedral, composed by Geoff Stephens in 1966, performed by the New Vaudeville Band, this cathedral has a number of “celebrities” buried in its crypts and floors. Those of note buried here are Jane Austen, Izaak Walton, King Canute (1016 to 1035), William Rufus, who was King of England from 1087 to 1100, known as William II, and Samuel Wilberforce, author and controversial figure in English ecclesiastical matters, who was bishop of Winchester from 1869 to 1873. Buried also were a number of lesser known kings and bishops, but in serious number, attesting to the high esteem in which this Cathedral has been held. Internally, most functions are as they were in the year 1,100. 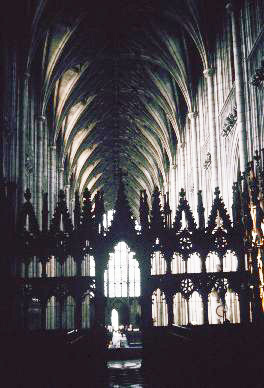 The columns of the nave and the windows were ”updated” to the then current perpendicular style in the late 14th century. The very large west window, built by Bishop Edington in the 14th century, with stained glass completed by Bishop Wykeham later in the 14th century, originally represented prophets and saints. However, it was destroyed by parliamentary troops during the civil war in 1642. 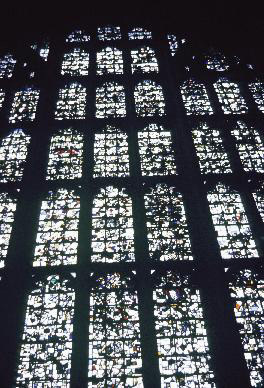 It was re-assembled randomly in 1660 when the monarchy was restored, so the present windows are constructed from 14th century glass, but with no particular pattern. Clerestory lighting highlights upper parts of construction, while larger chancel windows create a focus of light at the altar area. The chancel is basically everything east of the transepts, an area occupied by the clergy, or in this cathedral, monks. We gave some political reasons for the very long construction, but another factor can be the following reason: that of monks using and sharing the church with laity. Monks were in the chancel, congregants in the nave. 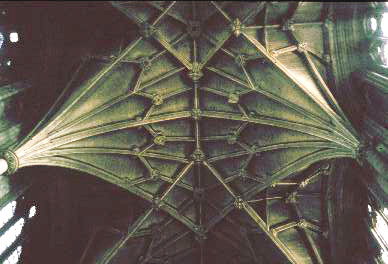 The stone-vaulting overhead shows some rather unusual ribs. The early types were very simple, running from each pillar to join at a common point, the boss. We have our first glimpse of the English “fan” vault, with the ribs radiating from the columns, fanning out, and converging to form pointed arches in the center. 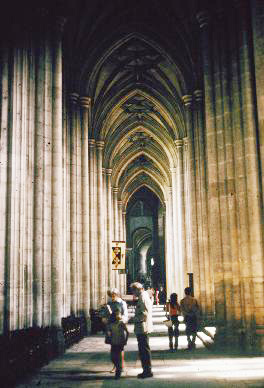 That centerline above the nave is now more directional than anything seen in France, and is like a crease in the pointed nave vault. The bosses enhance the effect. We shall see this repeated in Westminster Abbey. The eye is drawn immediately down the entire nave, through the choir and to the altar area. We cannot even distinguish anything like a quadripartite construction. What has developed here in England is a fan vault, with many ribs radiating out of the capitals of the nave columns, and literally fanning out across the ceiling of the nave, joined by intermediate ribs. The ribbing here is known as “lierne” (from the French “lien”, meaning, “tie”), and it is distinguished by the fact that some ribs do not begin at a pier, pillar, or column, but spring from other ribs. The ribs have three purposes. First, they provide a solid skeleton, which in the completed vault offers support to the overall structure. Second, they simplify construction. The relatively light ribs could be constructed on simple scaffolding, as opposed to creating a barrel vault, upon which stones would be laid. Once in place the ribs supported their own weight, while the remainder of the vault was filled. This avoided the need to build massive temporary scaffolding sufficiently strong to support the whole vault while it was built. Third, they have an aesthetic purpose, in that they create a rhythmic pattern along the line of the roof, and mask any flaws in the remainder of the vault due to settlement of the building. 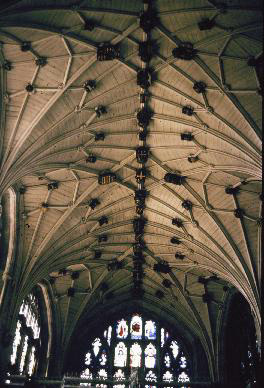 The ribbing in the crossing under the tower, and in the choir, is in wood, not stone, resulting from the fact that there was a major medieval tradition of using timber construction for vaulting in England. Some of the fine woodcarving in the choir. Given enough time, scholars are able to identify each carved figure. 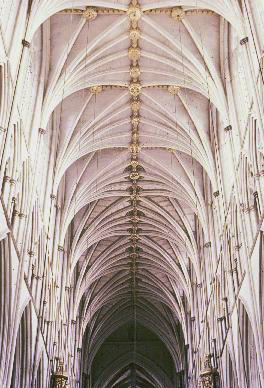 The masons who built Winchester cathedral did not push the limits as much as some others, but they did sometimes over-reach themselves, and encountered two major problems. First, the original tower collapsed in 1107 and had to be rebuilt. No risks were taken with the replacement, which uses massive, and carefully constructed internal pillars to support a relatively low structure. Second, the original foundations of the cathedral were not sufficiently strong. The result was that foundations moved throughout the life of the cathedral, and by the end of the 19th century a great deal of work was needed to secure the foundations, and preserve the building. A view down a side aisle, showing a very cohesive look, quite directional. Some of the stained glass, which is not as colorful here as compared to French windows, which flood church interiors with spiritualistic light. The climate in England is not very sunny, and if color in amounts used in France were to have been used here in England, there would be virtually no natural illumination in English churches. So for a rule of thumb, figure that minimal coloring was used in England, with glass almost clear. The transepts are all that remain of the original 11th century Romanesque church, dating back to 1079. 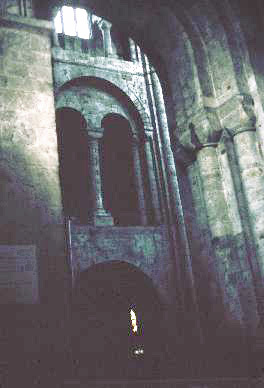 The semi-circular arches reveal the Romanesque nature of the construction, and here we see a bifurcated arch. This is part of a three-story construction. The original stone was imported from the Isle of Wight, but some of the uppermost levels are thought to have been salvaged from the ruins of the old Roman city. Another view of the two time periods, the Gothic (pointed) and the Romanesque semi-circular) in the transepts. Notice how rather clear the “stained” glass is. Underneath the tower support of the North Transept sits the Chapel of the Holy Sepulcher, dating from the 12th century. 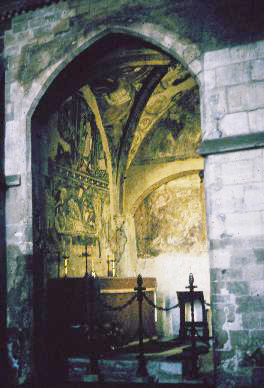 The paintings, probably frescoes, date from 1170, and were the last of their type created in England. The paintings apparently relate to the events of Easter, and depict scenes from the Entry into Jerusalem, Entombment, Mary at the Sepulcher, the Raising of Lazarus, and scenes of St. Catherine. 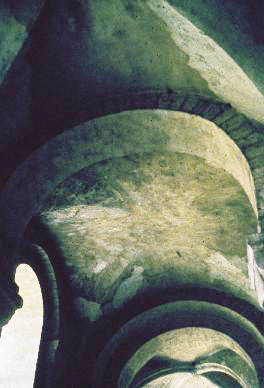 The semi-circular arches of the Norman Romanesque crypt, which lies under the High Altar. The area floods during rainy seasons, and is only open during a dry spell in the summer – if there is such. The construction is so very simple and strong. Looking closely you can discern the voussoirs of the round arches.